Apparently feria is just around the corner. I won’t bore you with the details of what feria is again (yet)… for those interested, check out the blog post somewhere around February or March of last year (that’s 2008). The point is: a year went by really, REALLY fast. I was shocked into this realization by the arrival of all things feria in our town square: video games and foosball. Among other things, I’m halfway through my second dry season, my APCD is coming up to scope out my site for my replacement this Thursday, and I’m into my THIRD season of mangos (mango season is only once a year people!). … Somewhere along the line my Peace Corps service turned on auto pilot. I’m two and a half months shy of two years in country, and only five months short of COSing (close of service). This shouldn’t come as a surprise to me. I have started to plan my life post Peace Corps—signing up to take the GRE (explain to me how knowing what it means to chase metal is going to help me out in grad school? 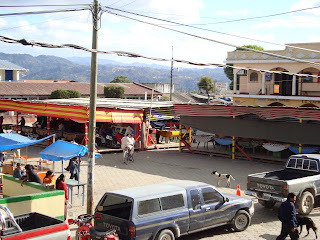 ), organizing my backpacking trip through Central America, trying to decide what to do with myself for the sixth months between applying for grad school and actually start school (providing I get in)—but somehow none of this sunk in until foosball reappeared in my town. Go figure. This of course is starting to make things hit home: e.g. I am going to have to start making some tough decisions (policy school, law school, vet school?). I can’t keep entertaining them all from now until eternity. Also, there are some things I AM going to miss about rural Guatemala, like being able to make a mango, strawberry, banana smoothie for less than $1 and Vicente Fernandez’s crooning voice on the camioneta. This stated; I am going to start taking advantage of things while I still have access to them. blove it! You make me smile. you never made me a smoothie while I was there...I guess the mangos weren't ready? I meant I love it! Your post is making ME anxious. Hmm, I guess I should start planning for post Peace Corps. Sara, Congrats! You're the "Peace Corps Blog of the Day" on the National Peace Corps Association's Twitter Feed (http://twitter.com/pcorpsconnect). When you have a chance, check out http://www.peacecorpsconnect.org and sign onto the social networking area, Connected Peace Corps. It's a great way to interact with members of the Peace Corps Community. Family and friends of Peace Corps are welcome too! The RPCV community is here for you when you get back to the States.